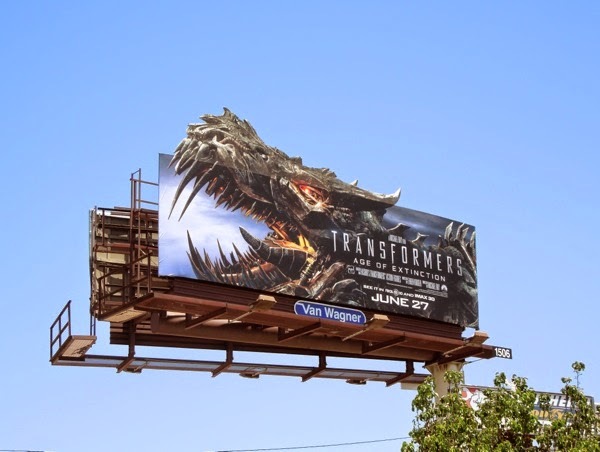 Summer is almost here again and so are the robots-in-disguise to transform the skies of L.A. with some eye-catching billboards for the fourth installment in the toys turned big screen movie franchise. 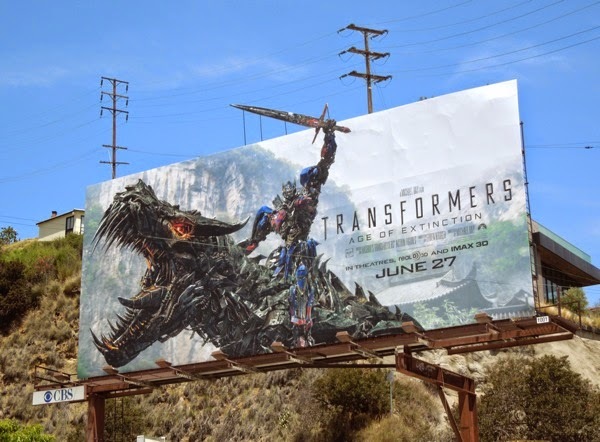 Not only is Autobot leader 'Optimus Prime' back, but it looks like he's brought some help to fight those evil Deceptacons in the form of fan-favourite 'Grimlock' and the Dinobots. 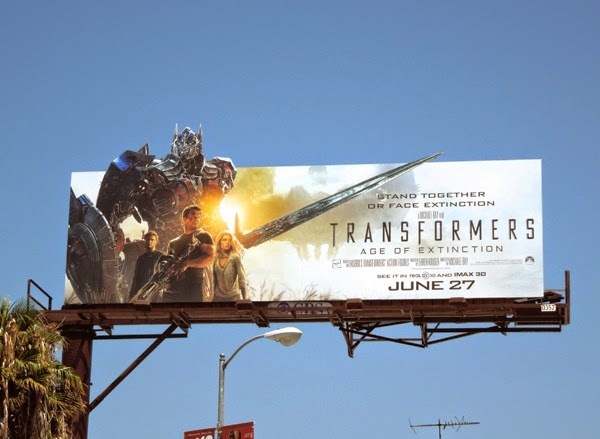 Transformers: Age of Extinction not only introduces these dinosaur-themed alien robots, but also welcomes Mark Wahlberg to the film franchise, as a car mechanic, who along with his daughter gets caught up in the explosive action and danger of the Transformers world. 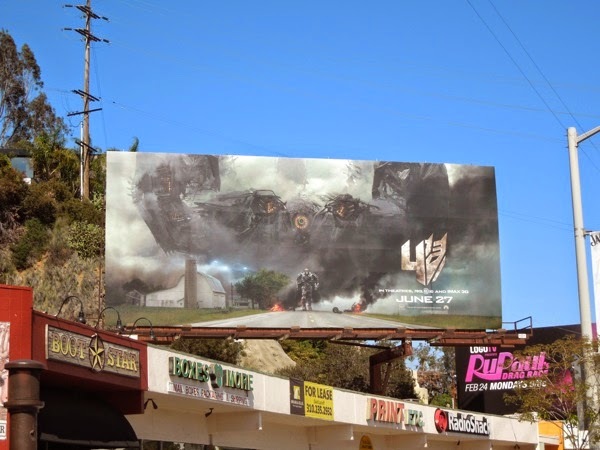 The ominous teaser billboard with a giant robot followed by a foreboding and monstrous spaceship was first spied along the Sunset Strip on April 7, and was also spotted along Melrose Avenue and Wilshire Boulevard. 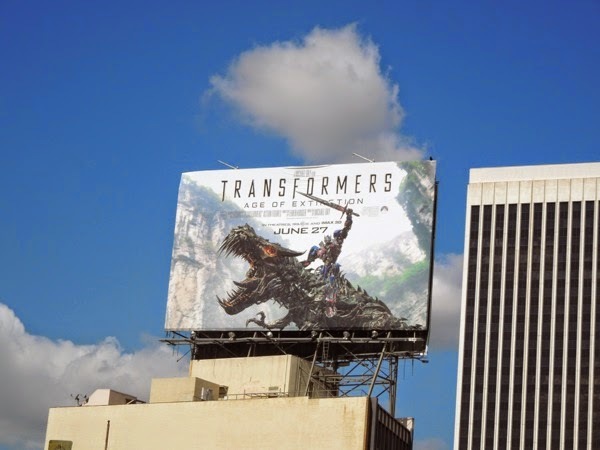 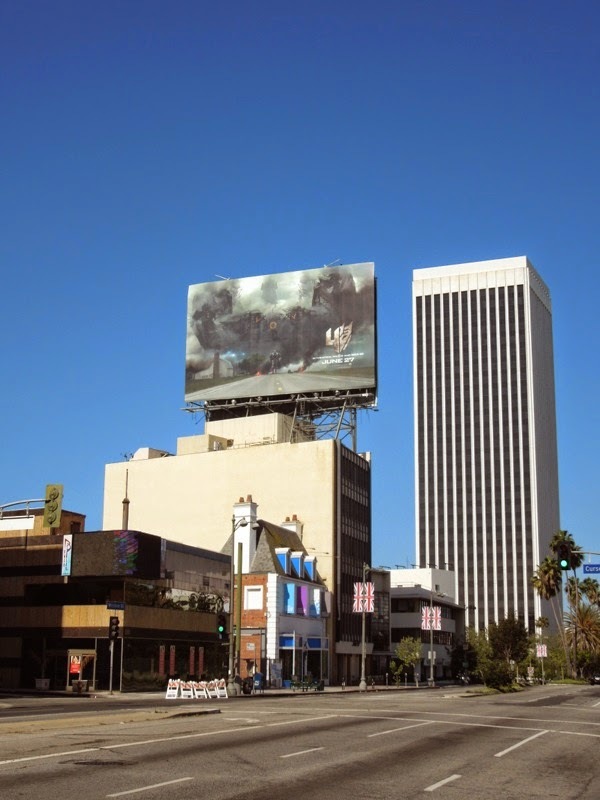 The special extension billboard with Optimus Prime riding Grimlock with sword aloft was snapped on April 30, with the standard version snapped high above Wilshire Boulevard on May 6, 2014, delivering what fans really wanted to see, roaring Dinobots in action. 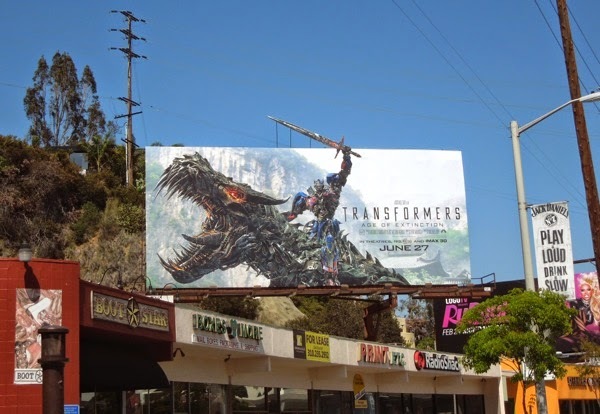 If you're a fan of the robots-in-disguise, be sure to check out these Transformers movie and theme park ride billboards from around L.A. since the Summer of 2009. 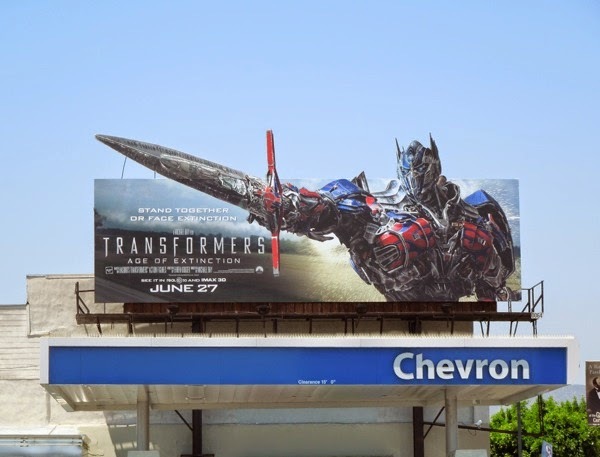 Plus be sure to also take a look at these original Autobot cars, movie costumes and props from the Transformers movies on display when the second and third films opened. 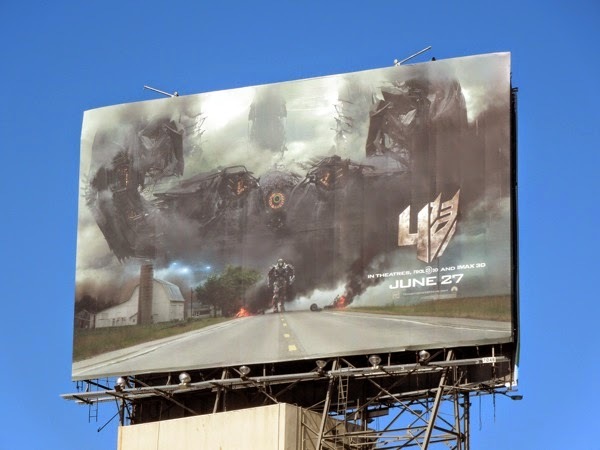 There's another giant monster launching in cinemas before Transformers: Age of Extinction, so be sure to check out these Godzilla movie billboards, and let's hope this new slice of sci-fi can offer something new and different from not only previous installments, but the other Summer box office blockbusters that are released before it. 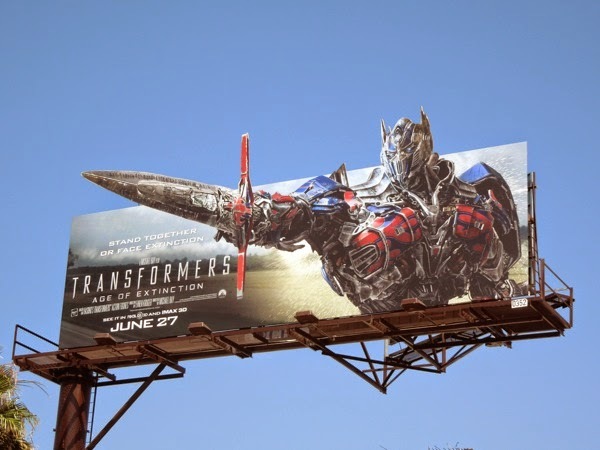 Autobots, roll out. 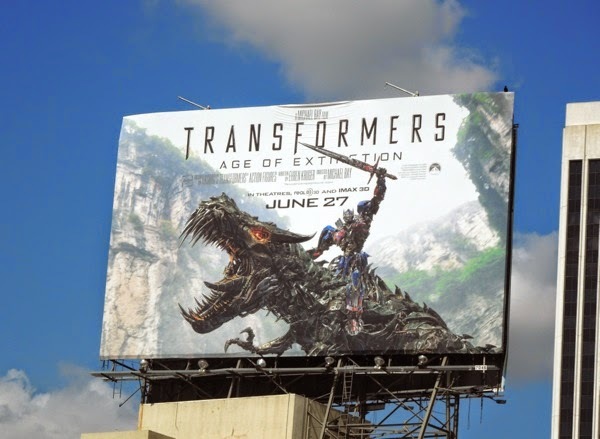 Dinobots, get ready to stomp some Deceptacons. 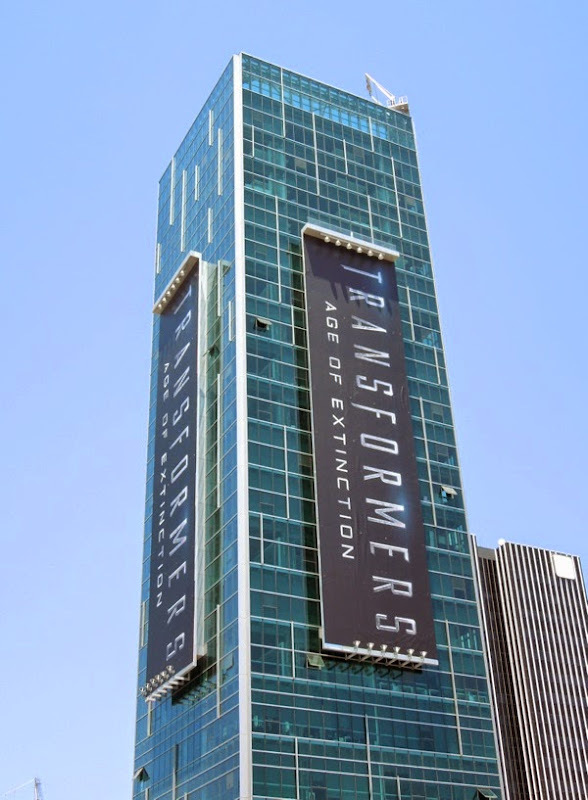 Things are about to get prehistoric around here. 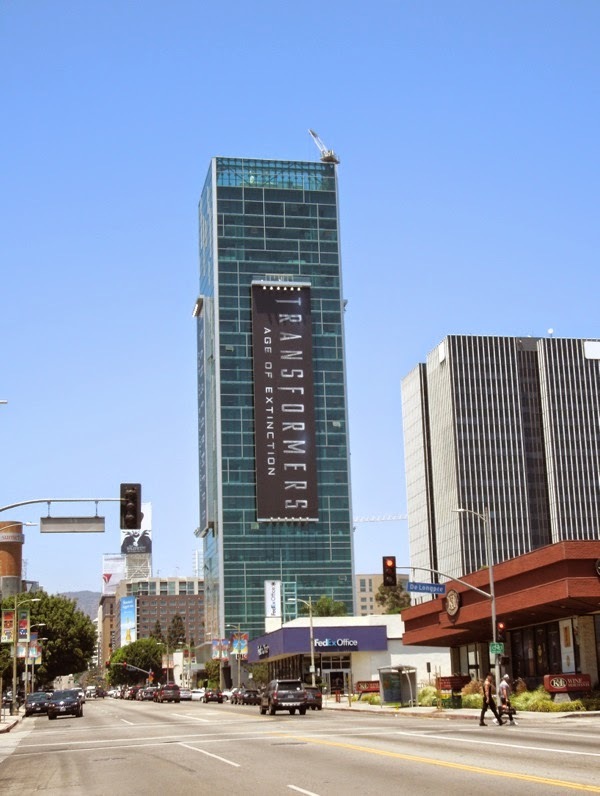 UPDATED: You don't jettison your human star of the first three movies (Shia LaBeouf) and then not use your A-List Hollywood actor, Mark Wahlberg, in any promotional material. 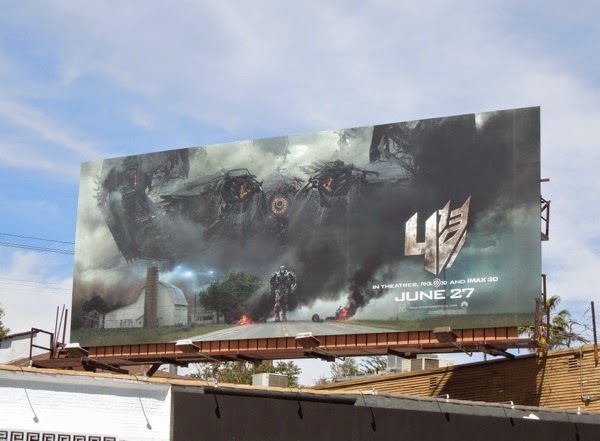 So enjoy this new special extension billboard for Transformers 4 with the actor side-by-side with the new-look Optimus Prime and the car mechanic's on-screen daughter (Nicola Peltz). 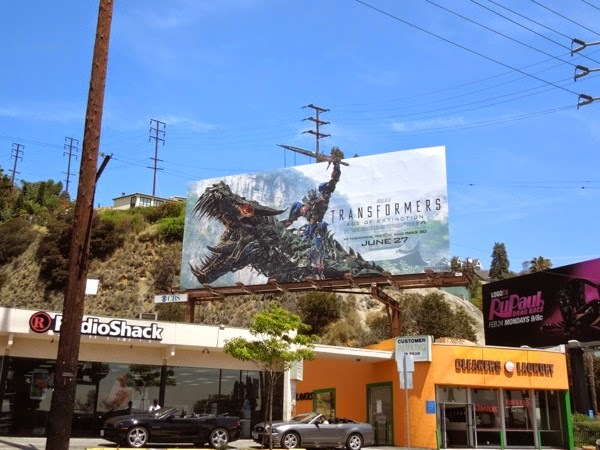 This human and Autobot creative was spied along La Cienega Boulevard on May 30, 2014 and Daily Billboard is sure more creatives will follow with under a month until the new movie opens. 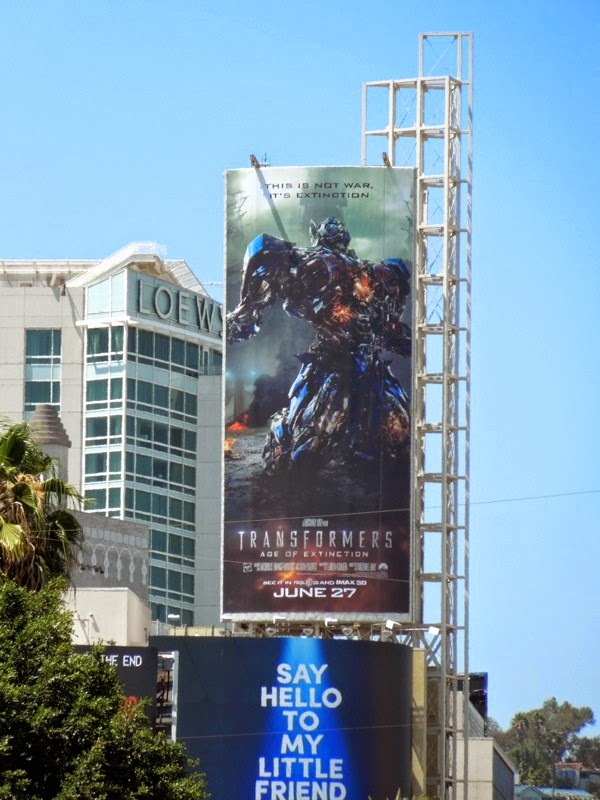 Plus here's another billboard for the film high above the Hollywood & Highland Center featuring Optimus Prime in a bit of trouble, again (he doesn't have much luck does he). 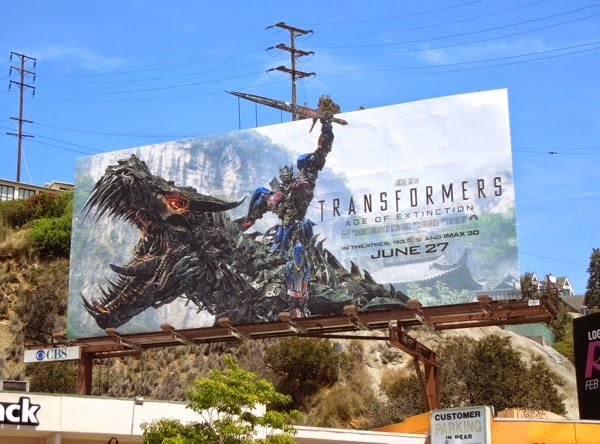 And here's another special extension billboard featuring Dinobot Grimlock roaring in the skies of L.A. at the intersection of Fountain and Highland Avenues on June 3, 2014. 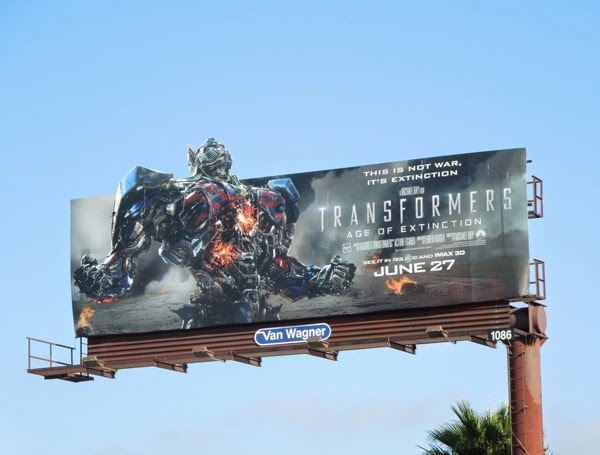 Let the countdown to mechanical carnage and explosions galore commence. 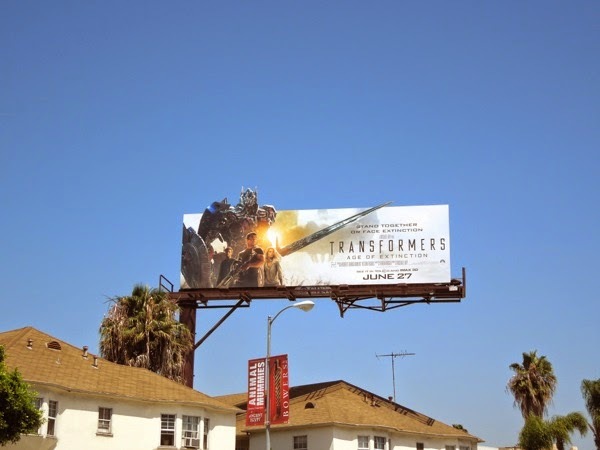 UPDATED: From all appearances it's all guns blazing with a whole new raft of special extension billboards invading the skies of L.A. for Transformers 4. 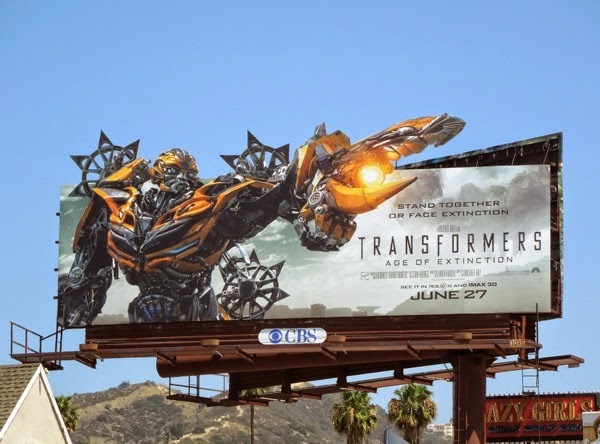 This may be the Age of Extinction but it looks like a revamped Autbots 'Bumblebee' and 'Optimus Prime' are ready for a fight with new weapons in robotic hand. 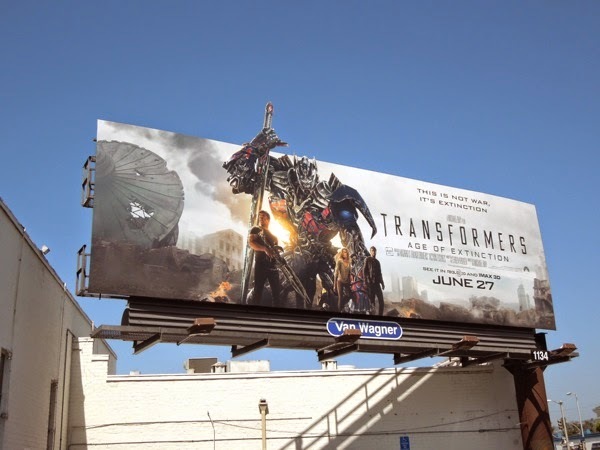 These in-your-face billboards, which should please any Transformer fan, were snapped on May 5, 2014 along La Brea Avenue and Beverly Boulevard. 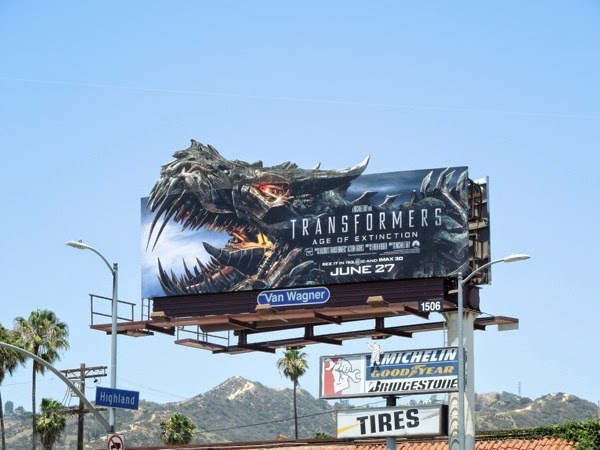 Looks like Paramount Pictures saved the best for last. 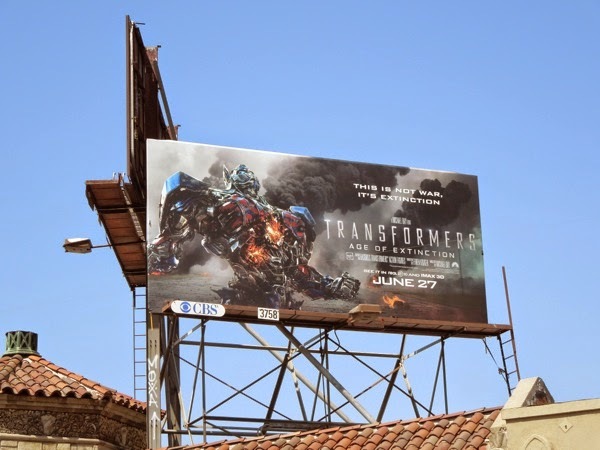 UPDATED: Paramount continues to unleash their onslaught of outdoor billboards for their new Transformers movie with the latest additions simply featuring the film's title towering over Sunset & Vine in Hollywood on June 12, 2014. 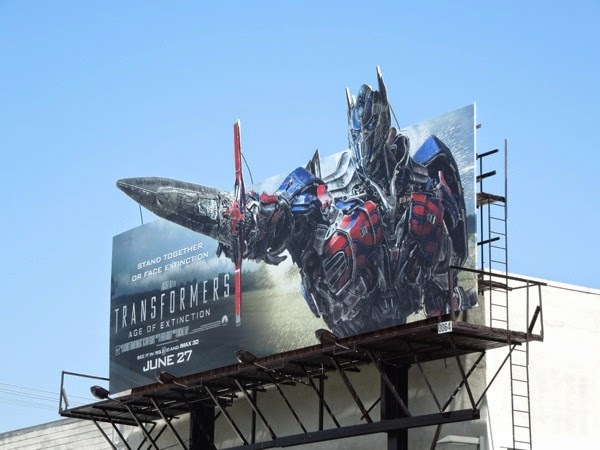 It's no wonder the studio is eyeing a $100 million box office opening weekend with this multi-million dollar OOH advertising campaign. 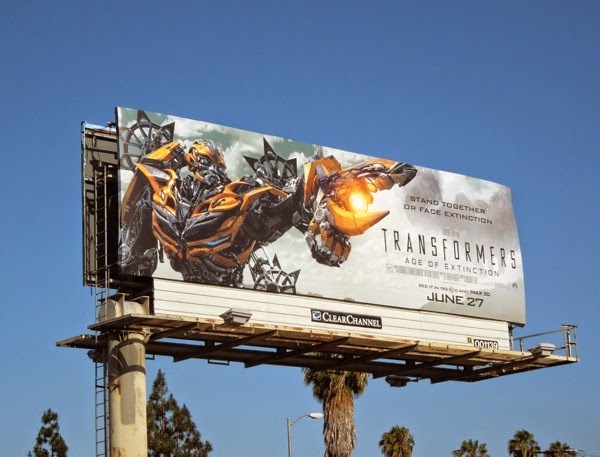 Here are also more standard billboards featuring Bumblebee and Optimus Prime, plus another different special extension billboard version spied along La Cienega Boulevard the same day. 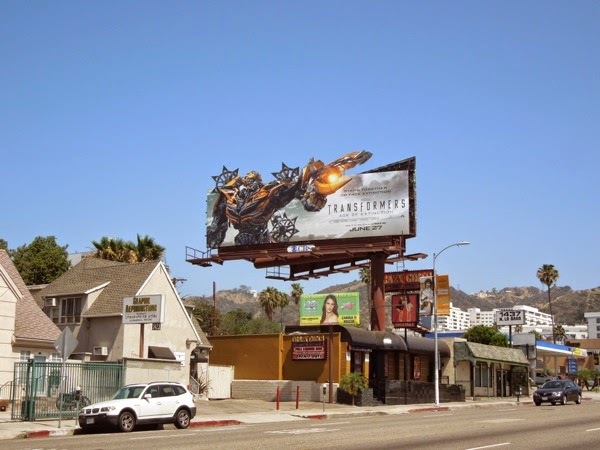 And we'll leave you with Daily Billboard's favourite extension creative, Optimus Prime wielding his futuristic sword, which makes for dramatic skies in L.A. at the moment.